A Saturday evening performance in Sunderland Minster, at 7.30 p.m., conducted by David Murray. Soloists: Sally Harrison – soprano and Alexander Robin Baker – baritone. A Sea Symphony is a piece for orchestra and chorus by Ralph Vaughan Williams, written between 1903 and 1909. 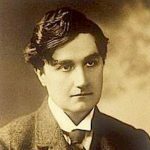 Vaughan Williams’ first and longest symphony, it was first performed at the Leeds Festival in 1910, with the composer conducting. The symphony’s maturity belies the composer’s relative youth when it was written (he was 30 when he first began sketching it). One of the first symphonies in which a choir is used throughout the work and is an integral part of the musical texture, A Sea Symphony helped set the stage for a new era of symphonic and choral music in Britain during the first half of the 20th century. Six Songs from ‘A Shropshire Lad’ by George Butterworth is based on the collection of poems by A.E.Housman. This newly arranged orchestration by P.Brookes is wonderfully evocative and one is left with a real sense of the tragic and futile losses in every sense resulting from the horrors of the first world war. This entry was posted on Thursday, May 7th, 2015 at 11:19 am	and is filed under Events.